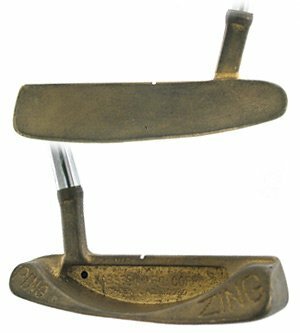 Like all the classic Ping putters of the 1970s - 1990s, the Ping Zing Original had a dull brass-colored finish which darkens slightly with use as the metal oxidises (soaking overnight in Coca-Cola improves this). It is an aesthetically pleasing design. It's all curves with no square edges. This is especially true because the design is slightly wider at the toe end than the heel, meaning that the back edge is not precisely parallel to the hitting surface. The original Zing has only a small white notch on the top bar of the putter for alignment. I find this makes the putter particularly difficult to align. This is a problem that's made worse by the curvy design - if you find aligning your putter a challenge at the best of times then this is probably not the one for you. The Original Zing gives you a very dead feeling when you strike a putt with it. There's no great sound to reassure you that you've made a solid strike. Instead all you hear is a dull thud. However, it's on fast greens that this putter comes into its own. 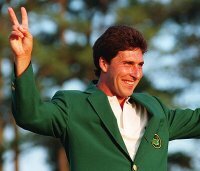 Because the feel is dull the ball doesn't jump off the putter face, and I therefore find I have terrific touch with this putter. Although it's toe weighted, you don't feel as if the toe is particularly heavy, so it doesn't feel like it's trying to release aggressively through the putt. Speaking of weight, I In fact found my Original Ping Zing to be too light for me and added lead tape to the base in order to give me a bit more weight behind the strike. Is the Original Ping Zing Collectible? 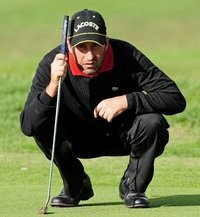 This design of putter was made famous in the 1990s by Jose Maria Olazabal, who won two US Masters titles with this putter.